The industrial PC market was valued at USD 3.30 billion in 2016 and is expected to grow at a CAGR of 6.2% to reach USD 4.73 billion by 2022. The base year considered for the study is 2015 and the forecast period is between 2016 and 2022. The increasing adoption of the IoT in the manufacturing industries is enabling industrial PC to connect through a wide network of intelligent devices that enhance factory automation in the manufacturing plants. The IoT helps in acquiring and generating a high volume of manufacturing data, which requires equipment such as industrial PCs for data acquisition and process control. The manufacturing companies are focusing on consolidating their production capacities to reduce costs and strengthen their competitive position by increasing production efficiency. For industries such as oil and gas, metals and mining, and so on wherein the profit margins are comparatively lower than other industries such as automotive and food and beverages, among others, it is critical to optimize their resources and reduce waste. Also, in the discrete industries, a minor flaw in the production process may result in huge losses, causing manufacturers to either recall their manufactured products or compensate by replacing the flawed product with a new one. Owing to this, the manufacturing companies are actively focusing on adopting industrial PCs to automate their manufacturing processes to enhance productivity, improve accuracy, and minimize operation costs, and achieve superior quality, uniformity, and safety. Hence, the growing demand for energy-efficient manufacturing operations is expected to propel the demand for and adoption of industrial PCs during the forecast period. The research methodology used to estimate and forecast the industrial PC market begins with capturing data on key vendor revenues through secondary research. The secondary sources include IEEE journals, automation world magazines, manufacturing automation magazines, and leading players’ newsletters. The vendor offerings have also been taken into consideration to determine the market segmentation. The bottom-up procedure has been employed to arrive at the overall size of the global market from the key players’ revenues. After arriving at the overall market size, the total market has been split into several segments and subsegments, which have then been verified through primary research by conducting extensive interviews of people holding key positions in the industry such as CEOs, VPs, directors, and executives. The market breakdown and data triangulation procedures have been employed to complete the overall market engineering process and arrive at the exact statistics for all segments and subsegments. The breakdown of the profiles of primaries has been depicted in the below figure. The research methodology used to estimate and forecast the market begins with capturing data on key vendor revenues through secondary research. The secondary sources include IEEE journals, automation world magazines, manufacturing automation magazines, and leading players’ newsletters. The vendor offerings have also been taken into consideration to determine the market segmentation. The bottom-up procedure has been employed to arrive at the overall size of the global industrial PC market from the key players’ revenues. After arriving at the overall market size, the total market has been split into several segments and subsegments, which have then been verified through primary research by conducting extensive interviews of people holding key positions in the industry such as CEOs, VPs, directors, and executives. The market breakdown and data triangulation procedures have been employed to complete the overall market engineering process and arrive at the exact statistics for all segments and subsegments. The breakdown of the profiles of primaries has been depicted in the below figure. The value chain pertaining to the industrial PC market starts with research and development (R&D), followed by the assembly, manufacturing, distribution, and post-sales services phases. The most important phases in this value chain include the R&D and assembly of industrial PCs. These PCs are designed based on their use in various industries such as aerospace and defense and oil and gas, among others, and on the industrial environment as well. Some of the major suppliers of industrial PC software are Advantech Co., Ltd. (Taiwan), Beckhoff Automation GmbH & Co., KG (Germany), General Electric Co., (U.S.), Kontron AG (Germany), Mitsubishi Electric Corporation (Japan), OMRON Corporation (Japan), Panasonic Corporation (Japan), Rockwell Automation, Inc. (U.S.), Schneider Electric (France), and Siemens AG (Germany). In November 2016, Advantech Co., Ltd. launched the PPC-6151C, the first configurable panel PC available in the market. This panel PC features a 15-inches true-flat resistive touch TFT LCD display and an optimized chassis with 2.5-inches SATA HDD bay. This PC can be equipped with various certified mini-ITX motherboards and configured to specific application requirements. In December 2016, Beckhoff Automation GmbH & Co. KG collaborated with SAP SE (Germany) for out-of-the-box IT/OT connectivity pertaining to factory automation and to contribute the robot cell technology used in track and trace systems. In August 2016 Advantech Co., Ltd. entered into partnership with Sigfox, a France-based IoT network infrastructure provider to expand the IoT network. This research report categorizes the global industrial PC market on the basis of hardware, data storage media, touchscreen technology, sales channel, end-user vertical, and geography. What are the various hardware of industrial PC’s and which one is best suitable for various industries? The industrial PC was valued at USD 3.30 billion in 2016 and is expected to grow at a CAGR of 6.2% to reach USD 4.73 billion by 2022. The growth in this market can be attributed to the increasing penetration of IoT across manufacturing industries, high R&D investments by the manufacturing companies to promote the adoption of industrial PCs, rising demand for energy-efficient manufacturing operations, and growing emphasis on regulatory compliances. Panel industrial PCs held the largest size of the industrial PC market in 2016. The growth of the market for panel industrial PCs can be attributed to their distinct features such as compact chassis, high-performance platform, enhanced flexibility, better safety control, and user-friendly touchscreens. Panel industrial PCs are the most commonly used industrial PCs in the process and discrete industries for data acquisition and process control operations. Solid-state is robust data storage medium for handling shocks and vibrations in manufacturing plants. It provides high-speed data access. Apart from providing consistent and faster input/output times, solid-state data storage medium offers similar levels of endurance and data integrity as other electronic devices; hence, require lesser cooling and power than its electromechanical equivalents. The market for capacitive touchscreen technology-based IPCs is likely to grow at a high rate between 2016 and 2022. This market growth can be attributed to the advantages of capacitive touchscreen technology-based IPCs over resistive touchscreen technology-based IPCs such as faster response time, higher accuracy, and no requirement for periodic calibrations, among others. The direct sales channel is the most preferred sales channel in the industrial PC market; this channel is likely to continue its dominance in the market between 2016 and 2022. The direct sales channels offer various advantages to the industrial PC manufacturers; they cater to the customization requirements of the end-user industries and eliminate resellers’ markup and the costs and risks associated with carrying large finished goods inventories. Due to these factors, the market for direct sales channels is expected to grow at a high rate during the forecast period. The growing demand for downtime, both logistically and commercially; increasing environmental concerns such as reduction of CO2 emissions; curtailment of fossil fuels usage; and fluctuating oil prices are reshaping the production landscape of the oil and gas industry. The oil and gas companies are focusing on incorporating new technologies in their production processes to reduce costs, while maintaining ecological balance. Due to the aforementioned factors, the industrial PC market for the oil and gas is likely to grow at a significant rate during the forecast period. North America held the largest share of the industrial PC market in 2016. The industrial manufacturers in North America focus on adopting advanced technologies to enhance their production processes and optimize output. The growing demand for improved process flexibility and enhanced efficiency, comprehensive integration of quality and regulatory requirements, harmonized production processes for optimum supply-chain management, and constant pressure of reducing maintenance and operation costs in the discrete industries are boosting the adoption of industrial PCs in this region. Moreover, several major players are increasingly investing in the market in North America, thereby propelling the growth of the market in this region. 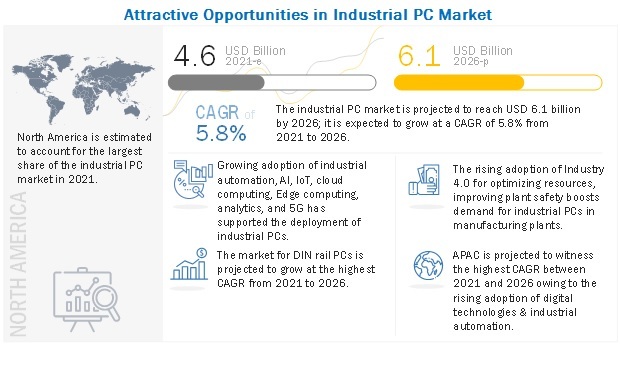 The industrial PC market for the discrete industries in APAC is likely to grow at the highest CAGR during the forecast period. The developing economies in this region such as China and India, among others, are transforming themselves into manufacturing hubs. In addition, global market players are expanding their presence in APAC. Also the demand for high-end automobiles, equipped with enhanced features such as car connectivity, is also rising. All the aforementioned factors are expected to drive the growth of the market for the discrete industries in this region. Which region is leading in industrial PC market? The increasing security threats are restraining the growth of the market. Since, industrial PCs are used at harsh environments, automated safety mechanisms are required to counteract in case of any theft, malfunction, accident, or malicious attack. 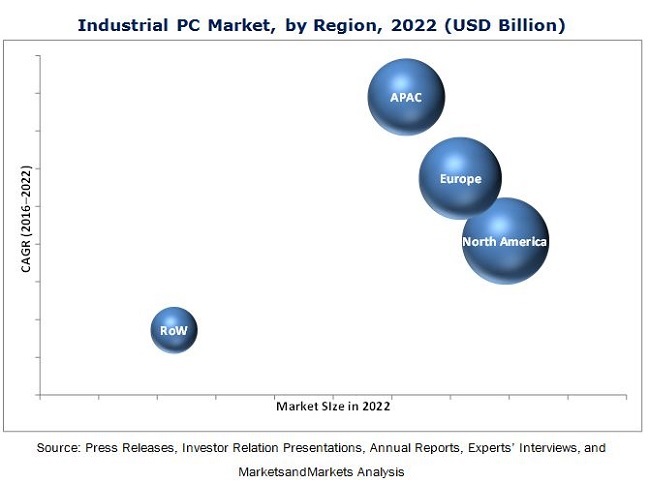 The major players operating in the industrial PC market include Advantech Co., Ltd. (Taiwan), Beckhoff Automation GmbH & Co., KG (Germany), General Electric Co. (U.S.). Kontron AG (Germany), Mitsubishi Electric Corporation (Japan), OMRON Corporation(Japan), Panasonic Corporation (Japan), Rockwell Automation, Inc. (U.S.), Schneider Electric (France), and Siemens AG (Germany). The key market players focus on new product launches and developments, acquisitions, and collaborations to enhance their product offerings and expand their businesses.